East Timor Legal News 16 July 2012 Source: The Dili Weekly 16 July 2012 14:37 Written by Venidora Oliveira - Fundasaun Mahein (FM) suggest the new Government create a Legal Translation Department in order to ensure that the legislation written in Portuguese especially for the Defense and Security Sectors, so members from these two institutions do not violate the law while carrying out their operations. “In future there is need for the Secretariat of State or a Government Department to do the translation of laws or documentation which is produced in the Portuguese language into Tetun, which should be officially recognized,” suggested FM Executive Director, Nelson Belo, in Balide, Dili. 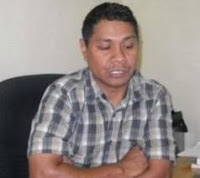 According to him, many members of Timor-Leste’s National Police (PNTL) and the Armed Forces (F-FDTL) aren’t familiar with their own institutions’ organic laws. Member of Parliament Joaquim Amaral agreed with FM to create a Governmental Translation Department. “I agree, we need translations so everyone can understand, however it shouldn’t be an obstacle for learning and abiding by the law,” said Amaral. According to him, this is a very important issue for the new Government; to look into and search for ways to ensure members of the community don’t violate the law because they simply don’t understand it .